You wake up in a strange land while an unknown voice narrates your every move. As you advance the pieces start to come together, literally. As the world returns to life around you, it all starts making sense. Something bad happened, the calamity. With no idea what that is, you set off on a journey to return the Bastion to life, a safe haven for everyone for when the calamity happens. Bastion is an action-RPG at it’s core, with gorgeous hand-painted backgrounds and a vibrant, living (eventually) world. You play as the voiceless, nameless kid as a man simply known as the Stranger at first helps you gather the pieces to return the Bastion (a safe haven to survive the calmity) back to life. 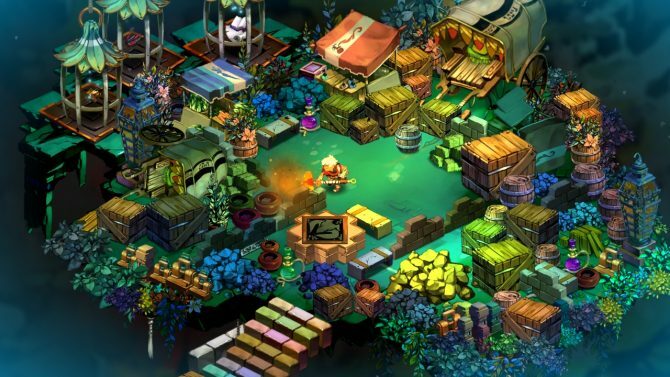 The first thing you’ll notice about Bastion is how vivid and beautiful the scenery is. The game starts off with you sleeping on what appears to be a floating room, removed from a castle or some other building. As you wake up, the second thing you’ll notice fires up; a whiskey-smooth voice narrating your every move in a fashion not unlike a classic Noir film. But there’s nowhere to go. With your first steps the third and most striking thing about the game presents itself. With each step, part of the path in front of you rises into place. 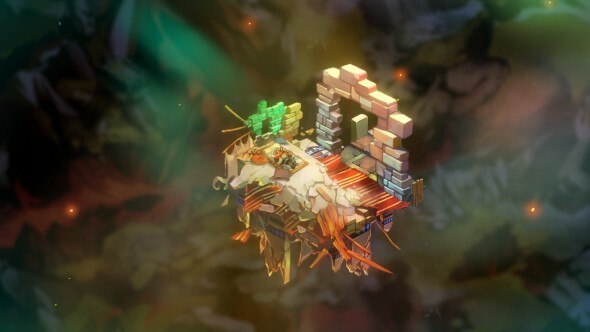 All these elements are present throughout the entire game, and create a wonderful atmosphere that will immediately set Bastion apart from it’s peers. Eventually you’ll find what the narrator calls your oldest friend, a large hammer which will serve as your first weapon. I immediately started bashing things, which the narrator commented on and encouraged. I continued however, upon noticing that nearly everything (including most of the walls) was destructible with my hammer, and some things dropped the games currency. At this point the narrator made another statement which made me smile for what would not be the last time, commenting on my unbridled destruction almost as if I were looking for some kind of reward. 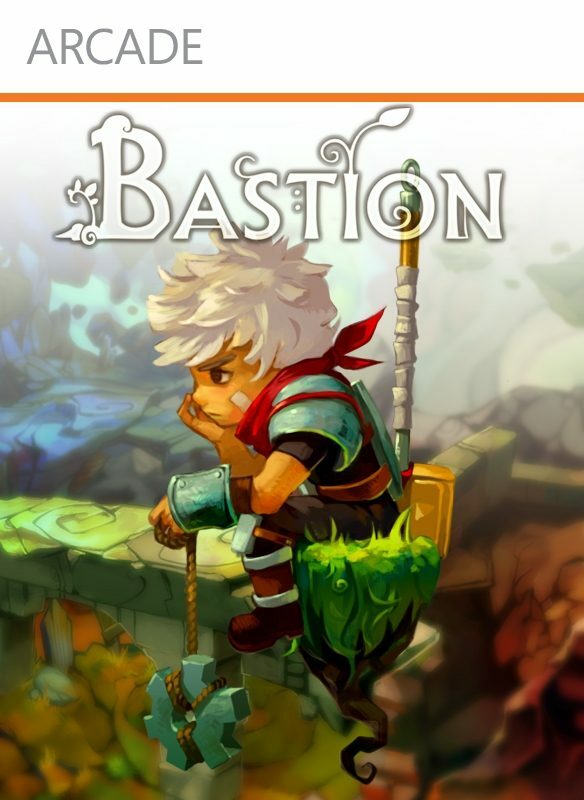 Ladies and gentlemen, Bastion just lampshaded Achievements. Eventually you come across the man who has been narrating the game who is simply known as The Stranger at first and shall remain so for the rest of this review to prevent any possible spoilers. At the end of the first level you grab a Core, and the Stranger journeys with you to the Bastion. He instructs you to place the Core you just found into the monument in the middle of the area, and as you do the shattered, desolate place starts to return to life, and the core goal of the game reveals itself. 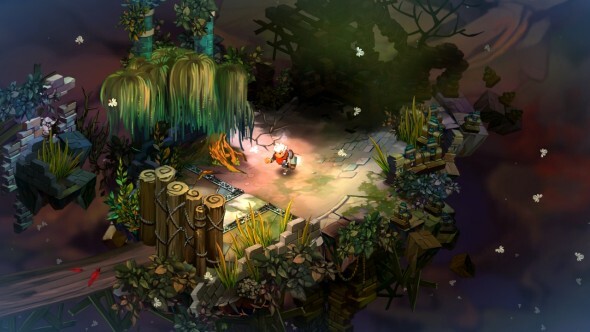 The Bastion itself serves as your home base throughout the game, and you need to restore it to life to reverse the Calamity. This is done by accessing the Skyway at the top of the map which will give you access to a few levels at a time which may or may not have a core, as well as some special levels called Proving Grounds. Proving Grounds are special levels designed around the myriad of weapons you’ll accumulate along the way. They’ll all have a different goal depending on which weapon the level is designed around. With the hammer you’ll have to smash a certain amount of debris, while the bow will have you clear a certain number of objects in the least amount of shots. These are a fun distraction from the regular stages and offer some nice prizes, as well as giving some nice tips on how to use the different weapons. 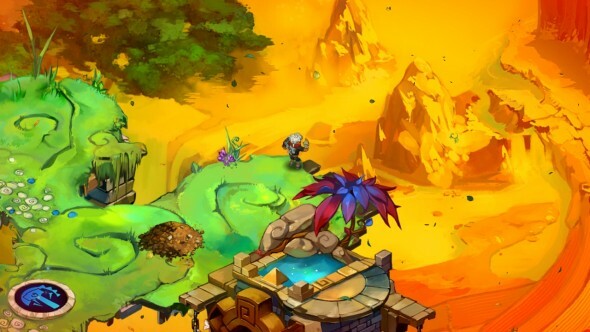 Each of the weapons can be upgraded at another building in the Bastion called the Forge, provided you have a certain item for each one and pay the required cost. Each upgrade tier has two choices though you can change which one you want any time you revisit the Forge. For example the first tier might offer a choice between greater attack speed or a larger critical hit chance, with the second offering a more powerful critical hit or a knock-back effect. There are several other buildings at the Bastion which offer a variety of services. The Distillery will let you choose a special drink each time you level up with bonuses ranging from the ability to hold more healing potions to one which in particular has my favorite name: “Stabsinthe” which automatically retaliates when you get it. One building in particular is literally a game changer, letting you activate a number of idols which function similarly to the skulls in the Halo games by powering up the enemies yet offering XP and monetary reward bonuses. The number of different weapons, drinks and idols alone create what will become a vastly different experience for everybody who plays it and allows you to mold the game to your own personal play-style. More importantly they offer incentive to replay the game using different setups. It wouldn’t surprise me in the least to see people try certain themed playthroughs such as using just long range weapons or perhaps a hammer-only run. The choice is there if you want it, and not forced if not. You could just use the same weapons the entire game with no punishment. As the story comes to a close after a long emotional journey, the Kid is presented with two choices which affect the ending of the game. Upon completion you’re given a choice that far too many games are missing these days; New Game +. Of course I immediately chose this option, and right from the beginning things are different. Not the game itself mind you, so far it’s all the same as the first time around though I haven’t completed it a second time at this point. But the Stranger’s narration is different, actually commenting on the fact that it feels like we’ve done this before, or saying how familiar things seem to the Kid. I mentioned briefly the beautiful visuals of the game, but I must bring it up again noting that these were all hand-painted. 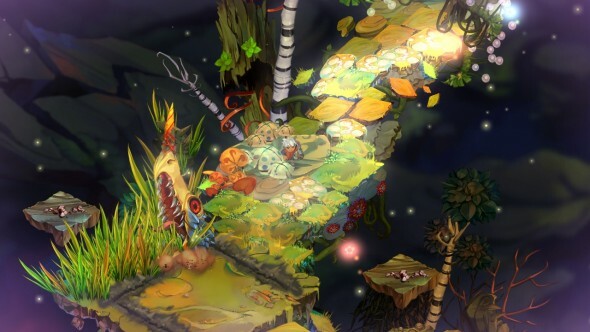 Different levels and environments of course have their own unique appearance and atmosphere, but most drastic of all is the Bastion itself as it slowly returns to life throughout the game. The game truly is stunning. The atmosphere is further intensified by the evidence of how alive the world used to be and how far it has fallen. The most jarring of which are easily the ash-molded corpses which fall apart with a single blow of your weapon. The Stranger will comment on nearly every person you find this way, often referring to them by name as if it were somebody he or the Kid knew. The game made me pause to reflect on what I was doing more than once, often wondering if I what I was doing was the right thing or not. Combat is mostly very straightforward and incredibly fun at the same time. Each of your chosen weapons has an assigned button, with another for a shield which can block or deflect attacks if timed properly. Throw in one more for healing and another for using your special attacks, and you have simplicity at it’s finest. The different enemies are easily distinguished from each other and while “mash attack until they die” works pretty well at first, eventually success will rely on the proper timing of your attacks and countering as well as efficient use of your special attacks and health potions. Each time you die in a level you’re given a chance to continue, with the number of continues you have depending on your drink and idol selection. If you do choose to continue, you’ll spring back to life at full health at the spot you died. This makes the most difficult parts of the game much less frustrating without cheapening the experience. 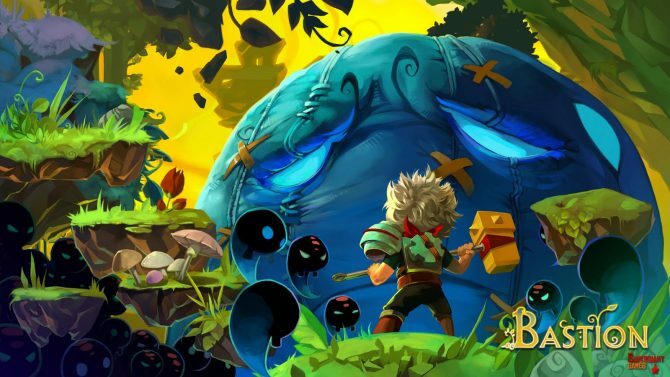 The game has a fairly long, well told and incredibly narrated story which will have you fully pulled into what’s going on in this world as you journey to restore it. The choices you’re forced to make will actually make you pause and strongly weigh the different options, and the outcome is sure to have you staring in stunned silence as the consequences unfold. 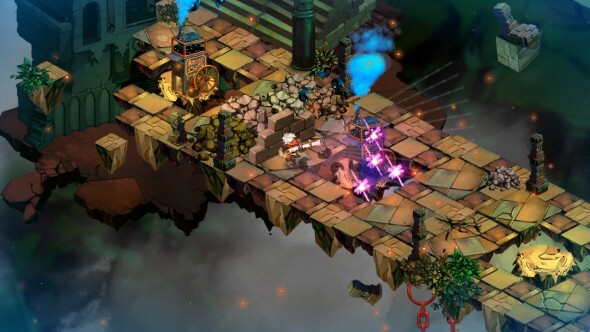 Throw in the New Game +, the Proving Ground levels and the difficulty increasing idols and Bastion is easily the most re-playable single player experience so far this year. I can easily see myself going through a few more times, even after I eventually get 100% of everything. The emotionally charged story will have your full attention, while the gripping combat will keep you on your toes at all times and the entire time you’ll be asking yourself if you’ll make it. 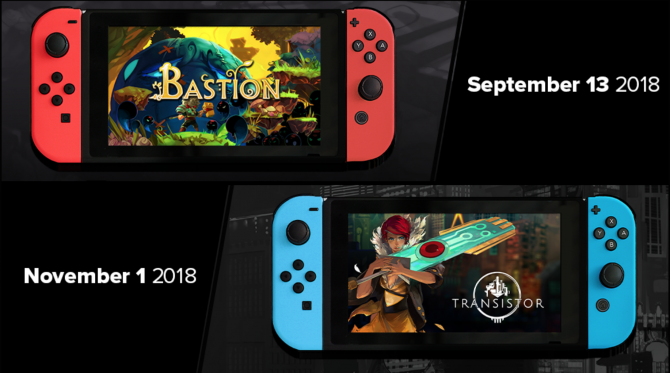 Will you fix the Bastion and save the world? Will you survive? Review copy info: A code for this title was provided to DualShockers, Inc. by the developer for the purpose of this review.